Hi, I decided to purge my followers of phishing bots and noticed that a few pages were very short, only showing around half a dozen accounts, some even showing none. The number of accounts on each page stays the same if I reload and navigate to the same page again. I suspect this may be because of deleted accounts - so far I’ve only gone a few pages in, so it’s entirely possible that the short/empty pages were once populated by phishing accounts. Edit: Confirmed after the phishing accounts I reported were deleted - the pages act as if the deleted accounts count towards the number to display per page, but doesn’t display them because they’re deleted. 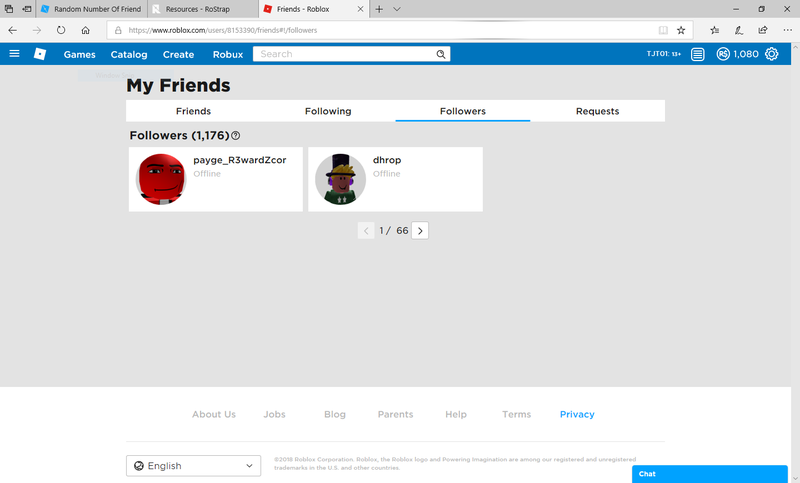 Browsing Roblox with Google Chrome on Windows 10. I have 128 friend requests according to my sidebar. Not sure if this is a bug to do with friend requests not being displayed or maybe bots that have been removed. Either way, I thought I’d let you guys know just in case. I have a similar issue involving my followers. As of this post I have 63 followers(not counting scambots/banned users). I think the missing followers are deleted accounts. I can confirm this happens to me. In the top left, I clearly have 360 incoming requests. There is an average of 6 requests per page (it’s very inconsistant). Doing some simple maths yields us 6*20=120 viewable requests. This is really odd. Perhaps since a plethora of my requests are bots, as mentioned in the OP, they could be deleted users.